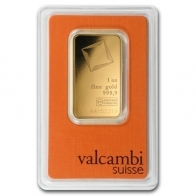 Buy gold bars manufactured by Valcambi SA, located in Switzerland. 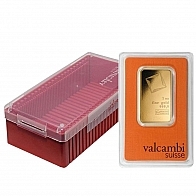 Valcambi is one of Switzerland's most prominent precious metals manufacturers. Their gold bullion bars are recognised by the Comex, and are approved by the London Bullion Market Association (LBMA). 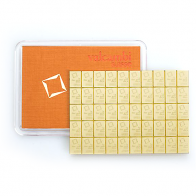 Valcambi gold bars are avaialable in sizes ranging from 1 gram to 1 kilogram, with the most popular gold bullion bars available in 1 ounce and 1 kilogram sizes. All Valcambi gold bars are 999.9 fine, and have an independent serial number. Discounted gold bars are available in boxes of 25 ingots. 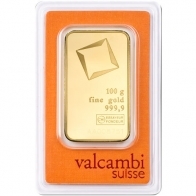 Valcambi also manufacture all gold bars for Credit Suisse. Valcambi gold bullion may be purchased using Bitcoin, Altcoins, Euros, US Dollars, Swiss Francs and Pounds Sterling, and may be ordered for tax-free storage in Switzerland or for delivery worldwide.